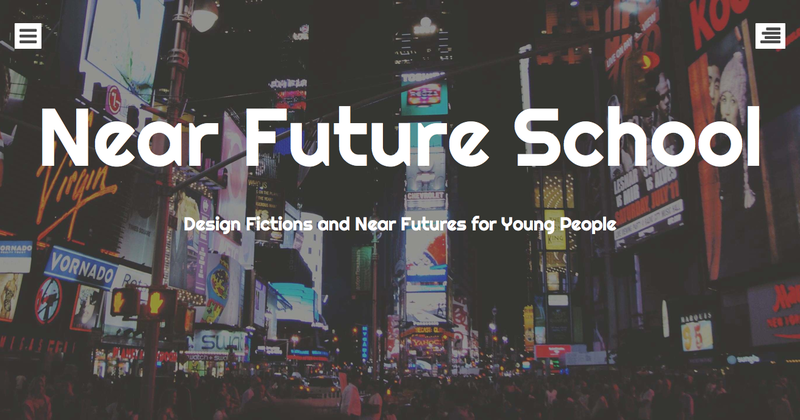 Sarah McNicol and I are working on a new project, the Near Future School. We’ve submitted a bid to the CCN+ seed fund but in the spirit of early career bootstrapping we’ve found a school willing to let us develop the project funded or unfunded. Our first Near Future School outing was at a school in Manchester. We wanted to conduct a rough and ready pilot of using a participatory design fiction method with year eight pupils. And we were blown away by what they came up with. We want you to get into pairs to write a short story. The story will be set in 2018, what it’s like to go to this school in 2018, but we want you to focus on what it’s like to be a pupil, to think about what it feels like, what does and doesn’t work for you and your friends. We want you to think about what it would be like to be new to this school, and maybe not speak English. What it would be like to be bored or bullied? What it would be like to be good at your work and get recognition for it? What would it be like to break your leg and have to work from home? Obviously we can’t know what these things will be like because 2018 hasn’t happened yet, it’s in the future. It’s an important date for you though because in 2018 you will be 16 and taking your GCSEs. So you want the school to be right for you to do well in your exams to take you where you want to go in life. Usually when we want to know what something is like we do research. We are educational researchers and this is what we do. There are however similarities between research and creative writing [it was a creative writing class]. To be good at both you need to be curious about people, about places and how things work. There are differences, in creative writing you can just write away with your imagination for a guide but in research you usually have to go and talk to people… today we’re going to write design fictions to mix the two, use fiction as research. The first group explored a dark scenario where a girl became increasingly isolated and lonely by technology, unable to find genuine human-to-human social contact, to be loved. She campaigned against all technology but failed. She became desperately ill from an unknown illness and became the poster girl for a campaign to save her from the condition but in this she was further isolated and alienated by the social media campaigns. Finally, she died cursing technology with her last breath. Technology has moved forward. Society’s going back. More and more kids go back home to a house without. That’s me. That’s the life of Sam. I walk to school everyday, backpack inside, tablet inside. Cars hovering in the air. Everyone’s life is pre-occupied, taken over by a little mechanism. My head down shoulders hunched, wandering to my favourite place. A place where I escape the fake intoxicating aroma of this world. The second group wrote a story that took place two years after the end of gender was achieved. I love the way the finger scanners won’t work unless your fingers are pristine clean. My alarm vibrated to the point of shaking apart – Apple doesn’t lie about the quality of their products – shocking me into almost falling from the air-pressure bed and onto the plexiglass floor. I put my clothes on, the bleak, government issued uniform that had a tie that itched my neck. I brought my steam-scooter out of the hall’s steaming sector and stuck my gender pride sticker on the bumper, the adhesive only coming off when exposed to plastic particles. Today was the 2year anniversary of the Gender Different Association (GDA) winning their case on taking ‘gender cases’ seriously, also promoting that we all accept each other for our mental capacity, not biological role or looks. I, being gender neutral, and inexplicably proud of the movement and want it to be recognised. I put my gloves on they kept my fingers clean since the god-damn finger print scanner is so faulty! Seriously! It only accepted ‘perfectly’ pristine fingers that had no water, crisps, mud or anything associated with it. I arrive at the school buildings, domes and bridges scattered around the shiny, clean campus. Litter anything and you’ll get fined. Since I’m 16 and was doing my GCFE’s (the new test the government regulated for this year), I had to go to the underground study and exam area for optimal learning.